You Searched For "MW82119B" - Talley Inc. Requires USB power sensor, sold separately. 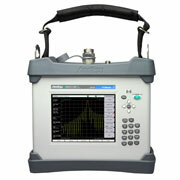 PIM MasterT B-series is a 40 Watt, battery-operated PIM analyzer featuring Site MasterT line sweep capability. With the Site Master option included, the PIM Master is able to fully certify cable and antenna system performance, measuring PIM, Distance-to-PIM, Return Loss, VSWR, Cable Loss and Distance-to-Fault with a single test instrument. PIM Master B-series is a 40 Watt, battery-operated PIM analyzer featuring Site MasterT line sweep capability. With the Site Master option included, the PIM Master is able to fully certify cable and antenna system performance, measuring PIM, Distance-to-PIM, Return Loss, VSWR, Cable Loss and Distance-to-Fault with a single test instrument.